Police are still investigating a serious collision between a motorcycle and a passenger vehicle that left the rider dead. The crash occurred near one of the turn lanes on East Busch Boulevard. According to witnesses, 26-year-old Salmane Benjelloun was westbound on East Busch when he collided with 21-year-old Remi Calderoni’s Ford Fusion; the vehicle was partially in the turn lane and partially blocking Mr. Benjelloun’s path. The rider was apparently ejected from the bike, and he died at the scene. Authorities may file charges in this Tampa vehicle collision. In many parts of the country, there are many fewer motorcycle wrecks during the winter months because the weather is too bad to ride. But here in the Sunshine State, riders are out in great numbers twelve months a year. One would think that Florida drivers would therefore be more aware of riders, but that’s usually not the case. Many drivers look out for other cars but overlook motorcycles. Many riders who have gone down probably heard the tortfeasor (negligent driver) say something like “s/he came out of nowhere.” The problem is usually not the motorcyclist’s reckless driving, but rather the tortfeasor’s failure to look. Broken Bones: When the rider is thrown off the bike in a high-speed crash, the violent collision often results in serious broken bones that require metal pins or plates during surgery. These injuries usually require extensive physical therapy as well. Head Injuries: Motorcycle helmets help prevent trauma-related head injuries, but they do nothing to prevent motion-related head injuries that happen when the head suddenly snaps back. Physical therapy will ease the symptoms, but brain injuries are permanent. Biker’s Arm: Most riders naturally extend their arms to break their falls. When their exposed arms hit the ground, Florida riders often sustain permanent damage to their brachial plexus, a key bundle of nerves under the armpit. Because of these and other serious injuries, motorcycle wrecks are usually exempt from Florida’s no-fault insurance law. So, most victims are automatically entitled to additional compensation for their noneconomic damages, such as pain and suffering, loss of enjoyment in life, emotional distress, and loss of consortium (companionship). To reduce the amount of compensation that victims receive, insurance company lawyers often attempt to shift the blame for the car accident onto the victim. The contributory negligence rule is one way, and the last clear chance rule is another way. If a victim has a chance to safely avoid a collision yet fails to do so, the tortfeasor is usually not liable for damages. The key is to safely avoid the wreck. For example, in the above story, a four-wheel vehicle can often change lanes very quickly, but a motorcycle is not as maneuverable and the rider often loses control in these situations. Arguably therefore, this defense does not apply to most motorcycle wrecks in Florida. 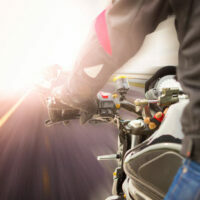 Motorcycle-vehicle crashes nearly always cause serious injuries. For a free consultation with an experienced personal injury attorney in Tampa, contact The Matassini Law Firm, P.A. We do not charge upfront legal fees in negligence cases. In order to help you more quickly, please fill out the quick form and submit, or call 888-377-0011.